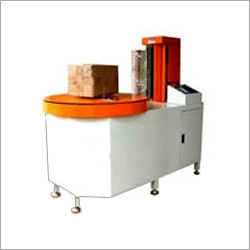 Durapak is a salient manufacturer, supplier of Carton Stretch Wrapping Machines that are simple to operate. Their use is to wrap the carton boxes and akin geometry objects by the use of stretch film, which is delivered from Powered Pre-Stretch Unit. The best feature of this Carton Wrap Machines is that it can be integrated into conveyor lines with ease. The Carton Wrapping Machines are ideal for those goods that are light in weight (up to 50 Kgs) and hence can be manually loaded, unloaded, wrapped, and turned over from the machine. These Durapak Box Wrapping Machines provide the ultimate stretch wrapped protection to small and medium sized objects that are packaged in cans, tins, carton boxes, drums, and other material. The 'powered pre-stretch' unit has the ability to stretch the LLDPE stretch cling film up to 300%.